Shared learning underpins learning communities and partnerships. 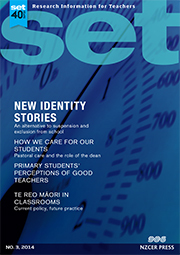 This article draws on case study data generated from shared perceptions of the use of inquiry pedagogy, Mantle of the Expert, applied to a drama-devising process at NCEA Level 2. Students, teacher, and researcher were positioned together as members of THEATRON, a fictional professional theatre company commissioned to develop original, devised drama for festival audiences. Reflective discourse observed while the company was working in role is seen to have had a positive effect on the development of effective collaboration between teacher and learners.